Sheila Bamforth, daughter of Maurice F Murray, has sent me the newspaper cuttings (below) regarding her father and her grandfather, Frank G Murray. Both rose within Johnsons to become, in turn, Export Director. Taken from The Chemist and Druggist, dated 26th April 1958. 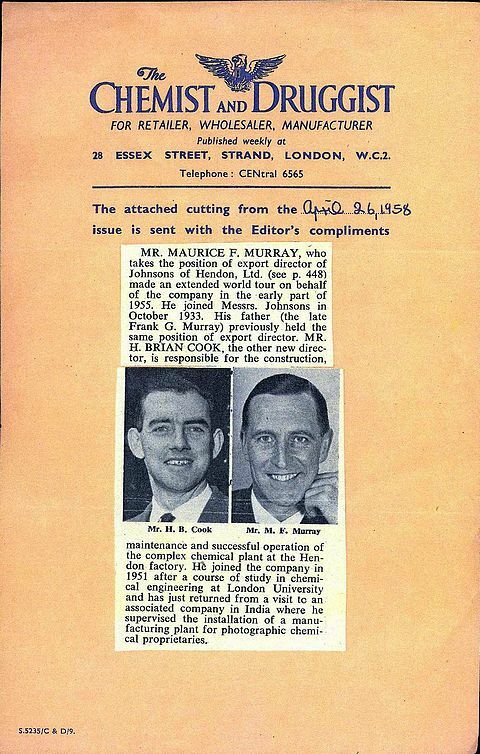 Mr. Maurice F. Murray, who takes the position of Export Director of Johnsons of Hendon, Ltd., made an extended world tour on behalf of the company in the early part of 1955. He joined Messrs. Johnsons in October 1933. His father (the late Frank G. Murray) previously held the same position of Export Director. Mr. H. Brian Cook, the other new director, is responsible for the construction, maintenance and successful operation of the complex chemical plant at the Hendon factory. He joined the company in 1951 after a course of study in chemical engineering at London University and has just returned from a visit to an associated company in India where he supervised the installation of a manufacturing plant for photographic chemical proprietaries. Mr. F. G. Murray's Golden Jubilee With Johnsons. An uncommon and happy event was the reason for a celebration party given by the Directors of Johnsons of Hendon Ltd. last Wednesday, at Hendon Hall Hotel. The occasion was the completion of 50 years service with the company by Mr. Frank George Murray, Export Director. Mr. Murray joined the company at Cross Street, Finsbury, in 1900 and, after experience in various departments, had some time at the Hendon works during the 1914/18 war, when the manufacture of coal tar developers was commenced. He returned to Cross Street to take charge of the purchasing department and to commence his world-wide travels. During the last thirty years he has visited every European country except Russia and Turkey. He made a prolonged trip for the company to the Far East, visiting Hong Kong, Shanghai, the Straits Settlements and Dutch East Indies. He has been to Burma and Ceylon and to India more than once and is a director of the Indian company allied to Johnsons. He has been to the United States and Canada more than once and is determined to pay a visit to Australasia. Mr. Murray was made a Director of the company in 1926 and has been in charge of the export activities for many years, being a founder member of the Institute of Export. During the afternoon, at the works, the staff and employees made a presentation to Mr. Murray of a handsome silver coffee service, a hand-made replica of those made during the period when Johnsons was founded - 1743. The evening celebrations included being presented with a gold cigarette case, suitably inscribed, by Mr. E. Bernard Cook (chairman of Johnsons) on behalf of his fellow directors; a gold dress watch was presented by Mr. Bernard Cook, on behalf of Allied Photographics Ltd, the Indian company associated with Johnsons; a magnificent silver salver was presented by Mon. R. Haesaerts, of Belgium, on behalf of 32 of Johnsons' agents throughout the world; and other personal gifts, from business friends in Scandinavia and elsewhere, were presented by Mr. Murray's son, Mr. M. F. Murray. An interesting souvenir of the occasion was presented by Mr. J. Pollen, Johnsons' export department manager, consisting of an album containing hundreds of letters and telegrams of congratulation received from Johnsons' customers throughout the world. Among the guests were representatives of the photographic and chemical manufacturers of this country, Mr. Murray's fellow directors, his personal friends, and representatives from the staff of offices and works of Johnsons. Of 170 guests who were invited,130 were present and the evening was reflective of the sincerity and esteem in which he is held throughout the Company.